The height of the NFL offseason usually brings with it the early rumblings of big-money, long-term contract extensions, so when the news broke that Seattle Seahawks quarterback Russell Wilson was seeking a new deal, it hardly sent shockwaves through media newsrooms. Until, that is, we discovered more about the parameters of the negotiation. Per NFL Insider Ian Rapoport, Wilson has given Seattle’s front office a deadline of April 15 — which marks the start of his team’s offseason program — for a new deal to be in place. If no agreement is reached by then, Wilson will still show up, he will participate in all offseason activities and he will play through the 2019 season under his current four-year, $87.6 million contract. However, Wilson’s side has stressed that negotiations will be effectively ceased thereafter. This, of course, would make him a candidate for the franchise tag next offseason, and that has opened up legitimate questions about whether 2018’s sixth-highest graded quarterback will be back in Seattle come the start of the 2020 campaign. Like with all contract negotiations, reports from both camps should be taken with a grain of salt – but that relatively well-known principle hasn’t stopped members of the national media from unleashing their takes about the six-time Pro Bowler’s value and on-field production. Luckily enough, we at Pro Football Focus have spent the last 13 years watching and grading every player on every play of every game, and we can rely on the data that we’ve collected over that time to effectively measure and rank player performance. We can also use that data to cut through the noise of click-bait soundbites and debunk the results of the eye tests that have been completed with the help of blurred vision. Wilson is not inconsistent. He is not easily replaced with a second-string quarterback. He’s shown no signs of being past his prime, and he’s certainly not worth trading away for merely a couple of first-round draft picks. Wilson is — and has been for some time — one of the league’s best at the position; he should be Seattle’s number one priority. Even in his 2012 college season, Wilson was a step above the rest, and he should serve as a glowing lesson to all who believe that measurables like height and hand size somehow trump talent and elite on-field production. After Wilson’s final year with the Badgers, which earned the fourth-highest overall grade that we’ve ever given to a college quarterback (93.6), Wilson was lauded for being a stellar passer who possessed the required arm strength and accuracy, and he was praised for his outstanding football intelligence and leadership qualities. Yet, come draft day, Wilson’s 5-foot-11 frame made all 32 front offices look past a player who had, on a snap-by-snap basis, separated himself from the pack. Wilson slipped into the third round of the draft and watched as players like Ryan Tannehill, Brandon Weeden and Brock Osweiler got their names called before his. And Seattle should thank their lucky stars that he did because Wilson came into the building and did what he had done at Wisconsin just a year before: He picked up the offense in a short time and was named the team’s opening-day starter. Eighteen games later, a stellar rookie season concluded with an elite overall grade of 90.5 which ranked second to only Peyton Manning and is still to this day the highest single-season grade that we’ve ever given to a rookie signal caller. But that was only the beginning of things to come. His rookie year was a sign of a bright future, and it set the stage for a career that has made even the most competent defensive coordinators lose sleep. Wilson has now graded at 74.0 or higher in all seven of his professional seasons; the only other quarterbacks to do so in that span? Tom Brady, Drew Brees, Ben Roethlisberger, Aaron Rodgers and Matt Ryan – an elite group to be a part of. Wilson’s most recent season, the 2018 campaign, was his best since his infamous rookie season; he finished the year ranked sixth among quarterbacks with an overall grade of 89.2 that was propped up by a third-ranked passer rating from a clean pocket (122.1) and a league-leading big-time throw percentage (8.9%). Given his year-to-year consistency, it comes as no surprise to see that he’s been as equally as consistent on a game-by-game basis throughout his time in the league. Since entering the NFL in 2012, Wilson has recorded 28 single-game grades of 80.0 or higher, which is the sixth-best mark among quarterbacks in that span. More impressively, however, is that out of the 112 regular season games since his NFL debut, Wilson has recorded just four single-game grades of 50.0 or lower. To put that number into perspective, Ryan Tannehill (6) and Josh Rosen (6) both recorded more sub-50.0 game grades in 2018 than Wilson has throughout his entire career, while Mitchell Trubiksy, Blake Bortles and Sam Darnold — all of whom were top-five picks — matched as many sub-50.0 game grades in 2018 as has Wilson has had in seven years of play. Since 2012 (including the postseason), Wilson has received a negative grade on just 7.1 percent of his offensive snaps, which is the second-best figure among the 66 quarterbacks with at least 2000 offensive snaps in the PFF era. His positively-graded play rate of 16.3 percent is good for 10th, and his entire body of work as a pro has culminated in an overall career grade of 92.6 which ranks behind only Drew Brees, Tom Brady, Aaron Rodgers, Peyton Manning, Matt Ryan and Ben Roethlisberger for the seventh-best mark among quarterbacks over the last 13 seasons. That is not the resume of a dispensible, middle-of-the-road player that the Seahawks can afford to let go. In fact, it’s quite the opposite. As our analytics team has discussed at great length, a quarterback’s production from a clean pocket is the most stable statistic to use when it comes to evaluating and predicting quarterback performance, and it’s in this precise situation where Wilson has shined throughout his tenure in Seattle. From the 92.1 clean-pocket passing grade he earned as a rookie to the career-high 92.6 clean-pocket passing grade he earned in 2018, Wilson has produced a clean-pocket passing grade of at least 75.0 in each of his professional seasons, with four of those grades ringing in at 90.0 or higher. And his passer rating tells the same story. After seven seasons of play, he has recorded seven straight 95.0-plus passer ratings from a clean pocket (with six of those ratings topping the 100.0 mark), while he’s ranked among the league’s top-10 quarterbacks in passer rating from a clean pocket in six of those seven seasons. Over his career, not including the postseason, Wilson has completed 1524-of-2114 clean pocket pass attempts for 17,606 yards, 141 touchdowns, and just 34 interceptions. His PFF grade per snap ranks third among the 50 NFL quarterbacks with at least 500 attempts since 2012, and his EPA (expected points added) per dropback ranks second, as does his 112.4 passer rating that is just a shade behind first-place Drew Brees (112.9). The analytics say that the best quarterbacks separate themselves by their play from a clean pocket. The analytics also say that above-average play from a clean pocket is predictable from season to season. Long story short: Wilson is one of the league’s best from a clean pocket, and he will likely continue to be so until the twilight of his career. Of course, you can’t mention Wilson’s ascendence to the top-tier of quarterback talents without mentioning his play under pressure, as the perennially revolving door that has been Seattle’s offensive line isn’t a secret as we head into the 2019 season. But, despite the team’s offensive line allowing an average of 172 pressures a season over the last seven seasons, and despite the fact that the offensive line has allowed pressure on 30.4 percent (fifth-worst among teams) of his dropbacks during his time in the league, the former Wisconsin quarterback has still managed to outperform his peers. Over the last seven years, Wilson has recorded a 70.0-plus passer rating under pressure in five regular seasons, making him one of only three quarterbacks to do so, with Matt Ryan (6) and Aaron Rodgers (5) being the others. It may not be the most stable statistic year on year, but it’s a crucial part of any quarterback’s game, and Wilson’s ability to make things happen with the defense barreling down on him is a part of what makes him so great. Wilson has completed 571-of-1,147 attempts under defensive pressure throughout his seven regular seasons. He’s turned those completions into 8,018 yards, 55 scores and just 29 interceptions; his career passer rating under pressure of 78.1 ranks fifth among quarterbacks with at least 300 pressured attempts in that span, his 67.8 percent adjusted completion percentage is sixth, while his 7.3 percent big-time throw percentage and his 7.0 yards per attempt are both good for third. 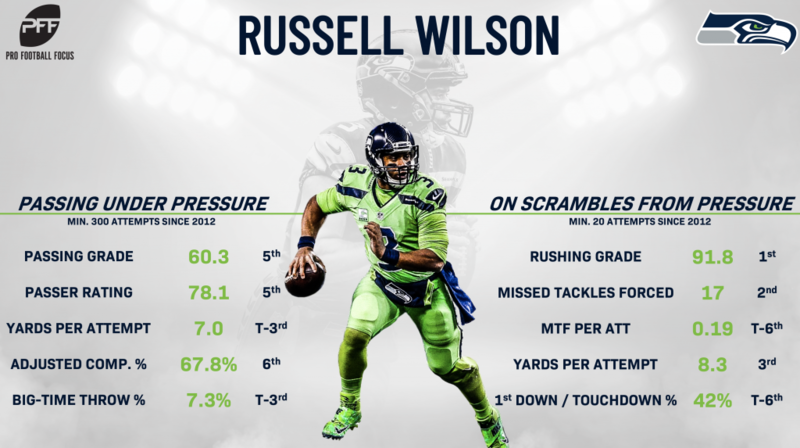 But his overall performance under pressure as a passer is only half of the story when it comes to understanding just how dangerous a player he is, because Wilson’s agility, speed and athleticism also give him the option to escape pressure with his legs, either to extend the play, or to tuck it and run. Since 2012, Wilson has scrambled out of the pocket on 11.9 percent of his pressured dropbacks, which is the fourth-highest rate among quarterbacks in that span. On the scrambles that turned into rushing attempts, Wilson has produced the highest rushing grade (91.8) among quarterbacks, forced the second-most missed tackles (17), averaged the third-most yards per carry (8.3) and has produced a first down or touchdown on over 40 percent of his carries. As both a runner and a passer, Wilson has come up with a successful play on 33.6 percent of his pressured dropbacks over the last seven NFL seasons, which is the ninth-best rate among active quarterbacks in that span, and it shows the ability that few quarterbacks possess in great strength: The ability to make something from nothing. When you put it all together, Russell Wilson’s passing performance up to this point has been unmatched. 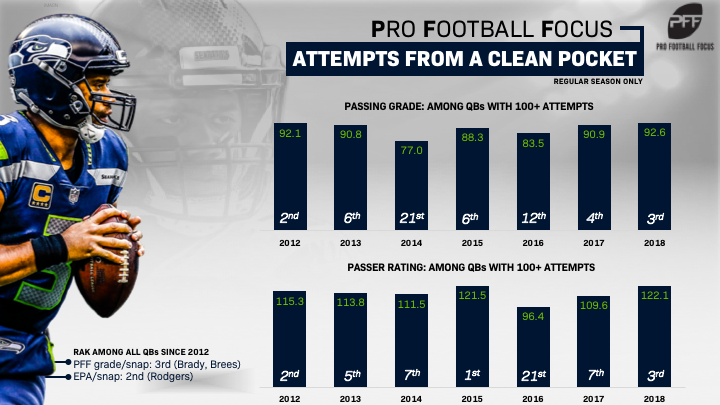 From attempts clean pocket to attempts under pressure, Wilson has produced a big-time throw on 6.79 percent of his career attempts, which doesn’t just rank first among signal callers since 2012, it’s the currently the best mark among qualifying quarterbacks in the PFF era. Not only that, his 7.90 yards per attempt also rank first, his adjusted completion percentage is good for sixth, his turnover-worthy play rate is good for 12th, and he’s done all of this while consistently pushing the ball downfield, as his average depth of target of 9.6 yards is currently the fifth-highest among quarterbacks over the last 13 seasons. In Russell Wilson, the Seahawks not only possess one of the most productive quarterbacks in the league, but they also possess one of the most accurate quarterbacks in the league – and that is yet another reason why the notion that he can be easily replaced by a lower-tier quarterback should be met with the required amount of skepticism. 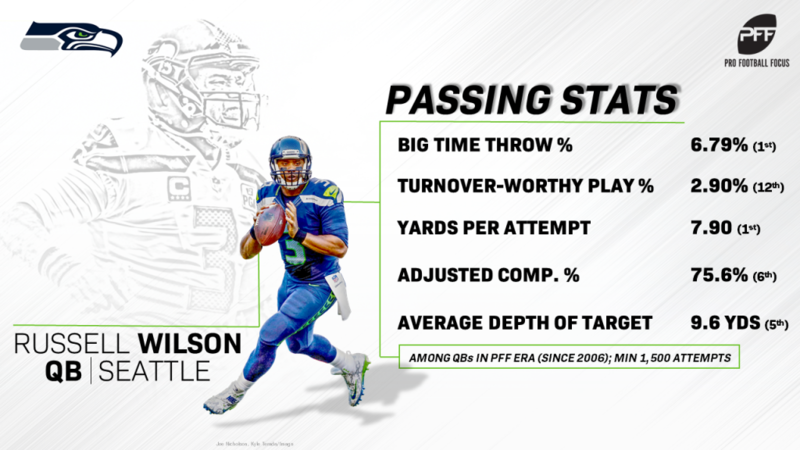 Since 2016, when we at PFF debuted our revolutionary quarterback accuracy charting, Russell Wilson has consistently been among the league’s top quarterbacks. Among the 37 players at the position with at least 500 pass attempts in that three-year span, Wilson ranks ninth in overall accuracy percentage at 62.3 percent, while he ranks fourth in perfect-accuracy percentage, at 20.6 percent. But those numbers only get better when we take away the expected throws and just look at the most difficult ones. Since 2016, Wilson has delivered an accurate pass on 128 of his 296 pass attempts into tight coverage, which gives him the league’s fifth-best accuracy percentage on those throws over that time (43.8%). More impressively, Wilson delivered a perfectly accurate ball on 80 of those throws, which gives him the league’s sixth-best perfect-accuracy percentage (27.4%). But lost in all of this though, his third-round pedigree, his ability to produce from a clean pocket, his ability to scramble away from pressure, and his ability to make pinpoint throws into tight coverage, is perhaps his most underrated facet of play – his ability to stretch the field with the deep ball. Wilson has been nothing short of prolific when he’s uncorked passes of at least 20 yards downfield, so it’s no surprise to see that only Drew Brees has totaled more yards from deep passes over the last seven years. However, like his all-around play, his deep-ball production doesn’t just make him one of the best quarterbacks since he entered the league, it has put him among the best to ever play the game. During his regular-season career, Wilson has completed a staggering 207 of his 472 deep passes, and he’s racked up 6942 yards, 72 scores, and only 27 interceptions. 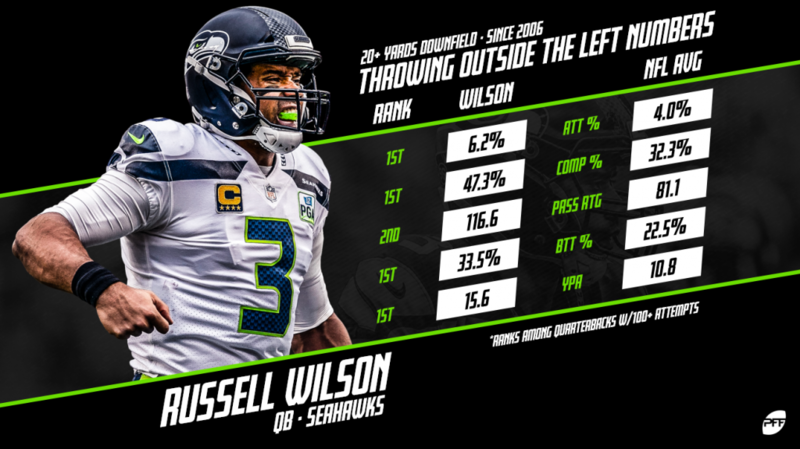 Among the 43 quarterbacks with at least 200 deep pass attempts in the PFF era, Wilson’s career deep-passer rating of 106.5 ranks third, his completion percentage of 43.9 percent and his adjusted completion percentage of 46.6 percent both rank second, while his 99.6 deep-passing grade ranks fifth, just 0.1 points behind Peyton Manning. There are so many different aspects of his game that make the former Wisconsin Badger great, but at this point, you have to marvel at the fact that Wilson has continually defied the odds, and he is simply capable of doing things that other quarterbacks just cannot do. For example, and it is a glowing one: Over the last 13 years, the least completed, least successful throw of the deep range (20-plus yards downfield) has been the targets outside the left numbers. Since the 2006 season, only 32.3 percent of these throws have been completed (as opposed to 32.4 percent outside the right numbers, and 39.3 percent between them) and quarterbacks have combined for an 81.8 passer rating and just 8.1 yards per attempt on these throws. Then, there’s Wilson, who ranks first among quarterbacks in the PFF era in completion percentage to this throw, first in attempt frequency to this throw, first in big-time throw rate to this throw, and first in yards per attempt to this throw. Likewise, at the intermediate range, the league’s least completed, least successful throw is the target outside of the right numbers, where quarterbacks have completed just 50.8 percent of attempts for an 81.8 passer rating and only 8.1 yards per attempt. 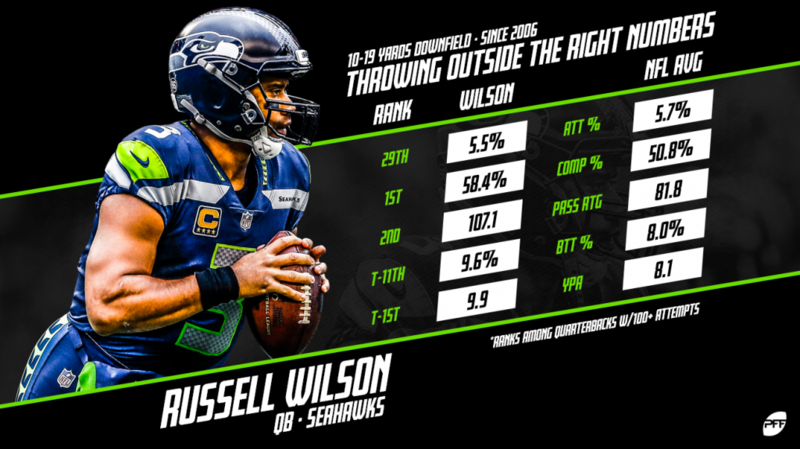 Again, Wilson has shattered the norms by completing 58.4 percent of those throws at an average of 9.9 yards per attempt – both the best marks by a quarterback in the PFF era. As if the entire package wasn’t enough, Wilson also has one other weapon in his arsenal: He is special in crunch time. Since entering the league in 2012, Wilson has amassed 17 fourth-quarter comebacks, which is second to only Matthew Stafford (21) in that span. On a snap-by-snap basis, though, no quarterback has been more clinical than the Seattle passer. 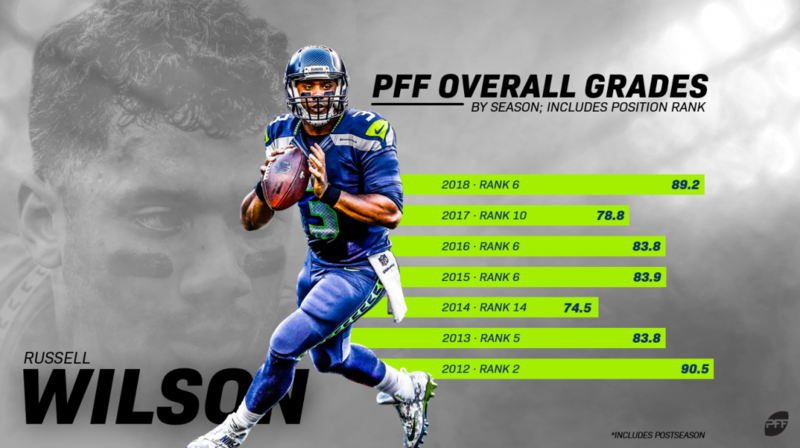 Through seven regular seasons, Wilson has produced a negative-grade on just 6.7 percent of his fourth-quarter plays – giving him the best rate among quarterbacks in the PFF era. His positively-graded play rate of 17.4 percent ranks third. On his fourth-quarter passing attempts, Wilson has completed 529-of-824, for 6845 yards, 68 touchdowns, and just 16 interceptions, while his fourth-quarter passer rating of 109.6 and his big-time throw rate of 7.4 percent both rank first among quarterbacks with at least 100 fourth-quarter attempts within the PFF era. His elite fourth-quarter passing of 90.2 ranks second to only Tom Brady — the gold-standard for comeback success — among quarterbacks with at least 100 fourth-quarter attempts since 2012. After everything that he’s done on the field, our wins above replacement metric classifies him as the sixth-most-valuable quarterback in the league since 2012, trailing only modern day titans of the game – Tom Brady, Drew Brees, Matt Ryan, Aaron Rodgers, and Ben Roethlisberger. Back in 2012, the Seattle Seahawks found themselves in the incredibly fortunate position to take Wilson after 31 NFL teams left him on the board because of his height, and given that more and more organizations are starting to overlook the old-fashioned, inconsequential measurables in favor of play-by-play production (see: Baker Mayfield and Kyler Murray) it’s a position they may never find themselves in again. The Seahawks found in the third round what most teams spend decades looking for: A reliable, consistent, top-tier difference maker at the most important position in all of sports. Trading that away in exchange for another shot at the lottery is simply a mistake that the franchise can not afford to make.